Proxicast - LAN-Cell Brand 3G Routers, 4G Routers, LTE Routers, HSPA+ Routers, Mobile Gateways, 3G Modems, 4G Modems, LTE Modems, HSPA+ Modems. Proxicast Supports LTE EVDO EV-DO GSM HSPA+ HSPA HSDPA HSUPA GPRS CDMA WiFi VPN. The LAN-Cell 3 is a commercial-grade mobile 3G/4G cellular router with enterprise-class routing and security features that allows multiple PC's, laptops, webcams, controllers, PLCs, and other Ethernet-based devices to simultaneously share a single cellular data account for primary or backup connectivity. In 2003, Proxicast began shipping the LAN-Cell Mobile Gateway - the industry's first rugged multi-port cellular router with full VPN. Since then, thousands of LAN-Cells have been carrying out mission-critical applications around the world in some of the harshest environments. 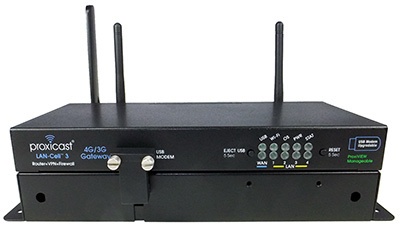 Unlike "consumer-grade" wireless 3G/4G routers and stand-alone cellular modems, Proxicast 3G/4G (LTE, HSPA+) routers are specifically designed to work with RTUs, PLCs, data loggers, video & web cams, controllers, industrial computers, and digital signage, as well as PCs and laptops. The LAN-Cell is also a great satellite data link alternative or backup for Low Earth Orbit (LEO) or VSAT satellite modem sites. Proxicast 3G/4G (LTE, HSPA+) routers are in use on most of the world's major mobile wireless 3G/4G cellular networks enabling a diversity of applications from monitoring weather stations to processing ATM & credit card transactions. Proxicast can help you cost effectively integrate 3G/4G cellular data communications into your existing or planned applications. No matter how you say "cellular router", Proxicast can help you to leverage wireless cellular data communications for your application. Our products support most 2G, 3G, and 4G cellular data standards (including LTE and HSPA+) and can be used on almost any cellular operator's network around the globe. Contact Us at 1-877-77PROXI or via E-mail at info@proxicast.com to see how Proxicast's LAN-Cell can work for you.